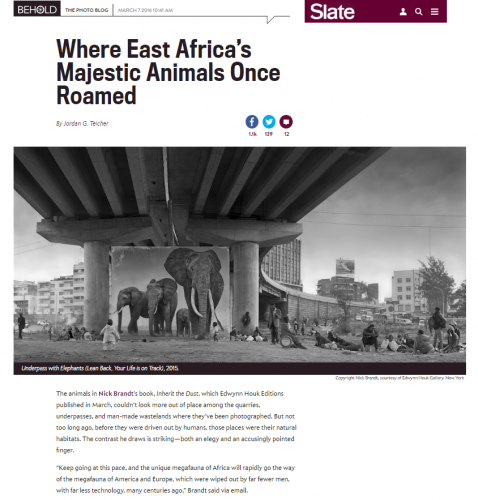 The animals in Nick Brandt’s book, Inherit the Dust, which Edwynn Houk Editions published in March, couldn’t look more out of place among the quarries, underpasses, and man-made wastelands where they’ve been photographed. But not too long ago, before they were driven out by humans, those places were their natural habitats. The contrast he draws is striking—both an elegy and an accusingly pointed finger. “Keep going at this pace, and the unique megafauna of Africa will rapidly go the way of the megafauna of America and Europe, which were wiped out by far fewer men, with far less technology, many centuries ago,” Brandt said via email. Brandt grew up in England, but when he first started photographing in East Africa in 2001 he was quickly struck by its natural beauty and grew concerned about its future. In the years since, he’s focused exclusively on photographing the region’s environment and animals for books including On This Earth, A Shadow Falls, and Across the Ravaged Land. In Inherit the Dust, Brandt has found new life for some of his unreleased photos from those years. To do so, he made life-size prints of the giraffes, elephants, and other animals in strips in his Southern California studio. Then, in Kenya, the strips were glued onto giant plywood and aluminum panels. It took as many as 25 men to carry the panels to select locations and then erect them in extreme heat, and, sometimes, intense wind and rain. They were often stationed for days at each location, waiting for the right cloud and light conditions so Brand could make his photographs. “It was quite an operation, and expensive to say the least, so all the more frustrating when people presume it was all done in Photoshop. But going that easy cop-out post production route would never look as good as placing the panels in situ, with all the unexpected interactions of local people, and light, etc,” Brandt said.